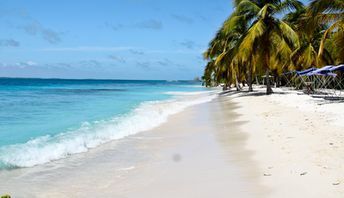 This beach ranks #3 of the "Best beaches in Venezuela"
In a contrast to other islets of the National Park, you can put a tent in Cayo Sombrero, but overnight camping is still prohibited. However, locals sometimes sleep in a hammock at night. As for the nearest hotels, these are located on the mainland - in the towns of Chichiriviche and Tucacas. Fly to Caracas international airport (CCS) and get by bus to Chichiriviche (via Puerto Cabello). Next take a boat to Cayo Sombrero. It is also possible to get by boat from Tucacas, but the distance will be slightly larger. The best time for a beach holiday in Cayo Sombrero, Morrocoy, is a slightly cooler winter half of the year. However, it is good here at any time of the year.